Our guide for younger patients was highly commended at the British Medical Association (BMA) Patient Information Awards last night (Monday 12 September). 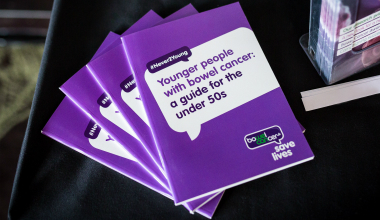 ‘Younger people with bowel cancer: a guide for the under 50s’ provides an introduction to how a diagnosis of bowel cancer at a younger age can affect the body, emotions, relationships and everyday life. The BMA patient information awards have been running for nearly 20 years and recognise excellence in the production and dissemination of accessible, well-designed and clinically balanced patient information.